GRANDPA: Hiding something, or just senile? The Fourth investigates, tonight at nine. Oo~ Plot twist! The Second really WAS trying to break the curse, then. I really like the little backstory here…and the anchor. Interesting how that didn’t come up before, eh? Looking at the fourth panel it seems like six individuals are going to have to open this portal because six closed it. Skärva, Derk, and Lorelei would probably be there. I wonder who else will show up. they could have saves SO MUCH TIME if the second just told them instead of sending them off for the book. i love you, Skarva 2.
does this mean we have to go into -ulp- the Library again? Expository dialogue AND another appearance by the Second? Oh come on, you get to see him all the time here in these comments! dun dun duuunnnnnnnn dat twist! Now we get to see Skarva have to put up with family and Cyril I foresee more orange rage in the future. Great galloping great whites, Skarva! Okay gang, we’re going to talk to Old Man Tiberius, and maybe get to the bottom of this mystery! When his quest* to defeat the gods is over it would be interesting to see a prequel about Skarva II’s adventures in trying to break the curse! But such a comic would be rather defeatist, wouldn’t it? You KNOW he isn’t going to get anywhere and is going to die half-crazy locking himself up in a library and smooching books. However, I would jump at the chance to draw young(er) Two exploring Idenau and doing his research. Maybe we can have some flashbacks! I do believe that was included in their previous trip to the library… or maybe I’m half crazy too. I thought you said something about that sometime ago, but I clicked on the archives button on top and saw the “by month” organization and immediately gave up without looking further. Smooching is not the same as kissing! …if it was smooching, there would be a lot more (and bigger!) pink hearts. ._. I’m sorry I got your hopes up for lustful sharkmanghost on book action. What a Chilling revelation yes? I bet snowbody saw that coming, gotta wonder why the cold man kept this slush slush yeah?Stay cool,cats I’m chillin out. Skarva’s book crazed grandfather is back. Dang, poor 4th. First the 2nd, then Posthumous, then Cyril, and now the 2nd again? And he doesn’t even KNOW about having to deal with Cyril yet. He’s going to go as crazy as Grandpa, only the homicidal kind. Well, MORE homicidal. Lol and I love the little detail that Crackers the 2nd completely forgot to mention he wrote the book in the first place. It would just figure, wouldn’t it? Captcha! “Trout Palate”. How fitting; I DO like seafood! I believe that Skärva II didn’t forget about that. Derk just pushed Skärva II’s rage button and kicked them out before he had a chance to tell them. Did you change Lorelei’s font? it seems.. smaller? Whos in that picture in pannle 2? could it be, the second himself? If I’m not mistaken, (I’m not, ;o), it’s the Third. 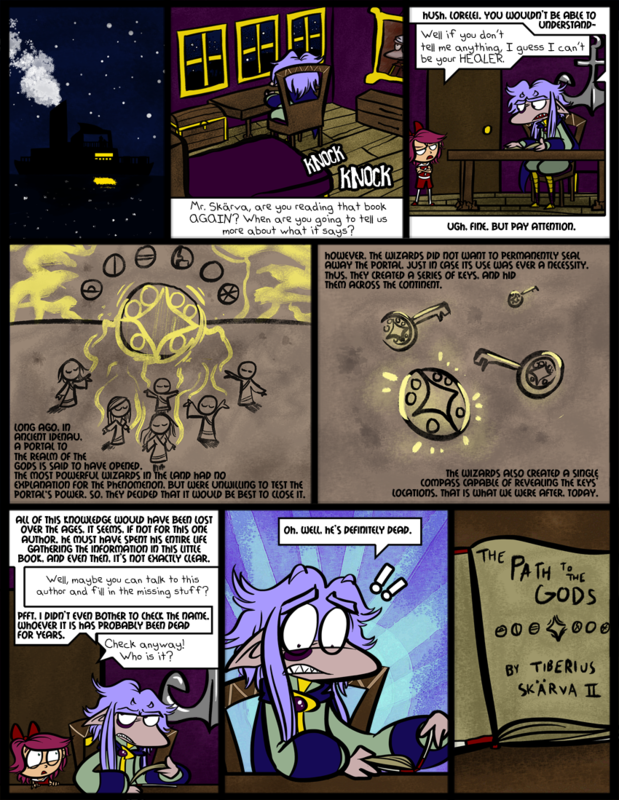 Nah, it really is just smaller XD There was a lot of text to fit in this comic, especially in that bottom left panel. Yeah, he didn’t want to hire Posthumous, but just wait til he sees that his minions have recruited Cyril! Aww, not even a filler? Sweetie! Backstage now. It’s going great!! Leg breaking does seem like a just punishment for no comic…I’m glad you agree with us, PJ! So long as it’s not her drawing arm. That is rather harsh, Bartimaeus. I hope your play went well! It did, thank you. I could not be more thankful for my fellow cast members and my directors, as well. …Two more performances next week, then I’ll have more free time, but I won’t see them but rarely… Sigh. Gee, really? What made you think that? Does the 2nd know about the (6?) wizards? Could, similar to the author, the wizards be ancestors as well? What could the 2nd hide? …..he sent them on a wild goose chase for a book he wrote himself. Hm. Maybe he did it on purpose. Do ghosts gradually forget things about their life over time? Or do they remember things forever? Depends on the ghost, I should think… of course, some tend to pine over their lives and ruminate on their memories more, while others move on and keep busy. Your average ghost should remember things well enough, given the passing of years… of course, the Second was rather cracked before he was even dead. Awh man, why can’t I save the picture as an image? It’s adorable! poor blank, He should have taken the potion.